Day 149 of 365 Days of a Happy Home! The more formal entrance to your home is known as the foyer. It should say “Welcome Home” to whomever enters. You don’t get a second chance to make a good first impression. So, make sure the area has clean walls, a rug to catch muck from wet shoes or boots, a small table to collect keys or mail and mirror to check yourself before you leave the house. Here are a few foyers we have had the pleasure of designing… What’s in your foyer? Leather wrapped mirror over the small mahogany sideboard are just a few extras in this bright foyer. We picked Benjamin Moore’s Bold Blue (a color found in the rug) for the inside of the door. It’s a nice contrast to the grass cloth on the walls. Adjacent to the front door shown above, there is a cozy love seat and pinch pleat drapes to warm up the space. There wasn’t much space here, but we could fit this antique side table next to the door. It’s just enough space to drop the mail or your keys. The trim color (Benjamin Moore’s Kendall Charcoal) is a nice contrast to the walls and helps to define this cozy space. 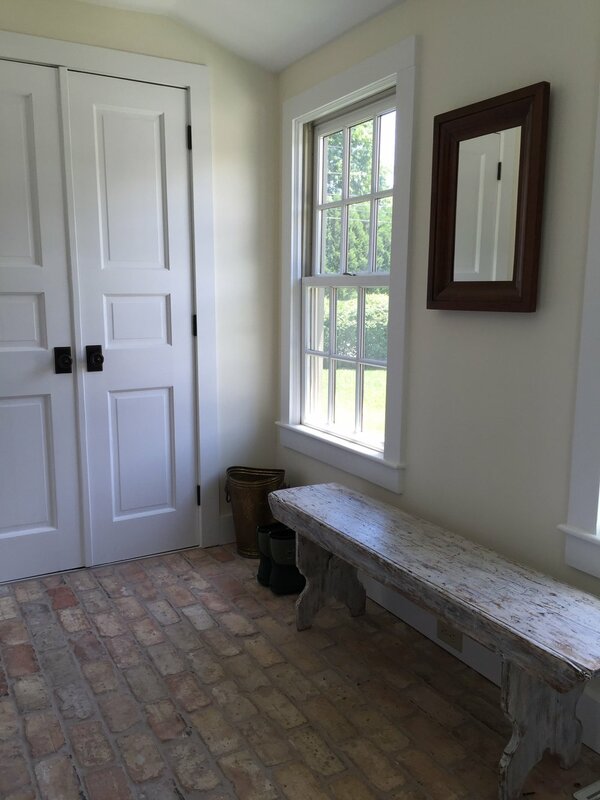 This large foyer has a separate mud room complete with a bench and pegs. The walls are v-grove panels painted the same color as the foyer, Benjamin Moore’s Stonington Grey. The difference in texture adds visual interest. There is beauty in the simplicity of this foyer. The reclaimed antique brick floor can handle the elements brought into the house. The antique ogee framed mirror and antique bench complement the space. Day 148 of 365 Days of a Happy Home! Is your Happy Home defined by just 4 walls? Or are you fortunate enough to have an "in law apartment" or separate out building on your property that you use as a guest house? Maybe you Air BnB this space? (Yes, I think "Air BnB" can be used as a verb!) In either situation, you understand it can be tricky to fit in a place to cook, dine, sleep, bathe and live into a compact space and still be able to breathe! Here are some places we have had the good fortune to tweak for compact living! This kitchenette in an apartment over a garage has enough counter space to prepare a simple meal. There is an under counter refrigerator with a panel to match the cabinets. A high shelf will display glassware and dishes. 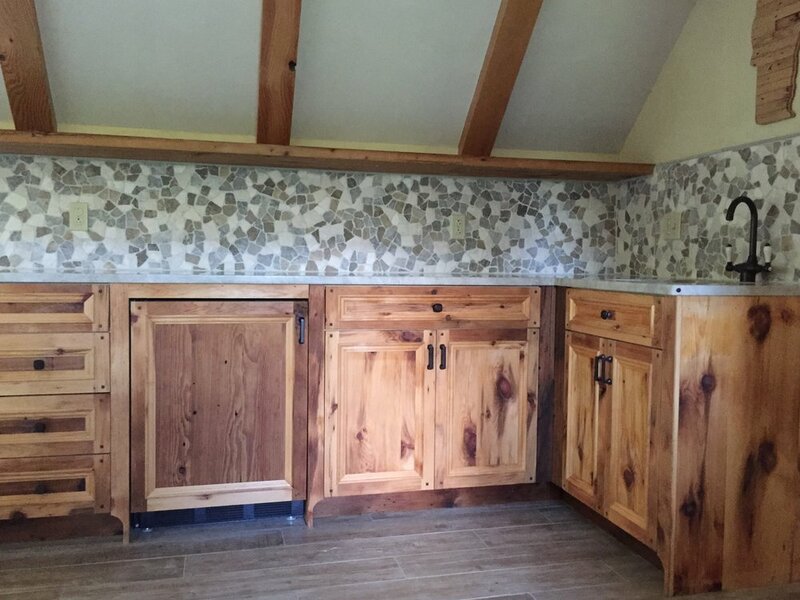 Here is another galley style kitchen in a barn renovation. We were tight on space and wanted to work around original posts in this 150 year old barn. Again, shelves to display glassware, dishes and bowls. Using shelves instead of upper cabinetry gives an openness to a tight space. We added track lighting from a beam near the ceiling to highlight that wall. The SMEG retro fridge is tucked in under a set of stairs. This galley kitchen is separated from the living space by a half wall. In this tiny bathroom we used a smaller sink in order to have more counter space. We tucked a walk in shower into a corner (you can see the reflection in the mirror). Here we opted for a glass shower door to make the space feel bigger. This compact sofa from Kravet is actually a sleeper! When you are short on space a sleeper sofa, day bed or futon are great options. If you are still at a loss for ideas, head to your nearest IKEA! They never disappoint with what they can do with a small space! Day 147 of 365 Days of a Happy Home! Functional and Beautiful! 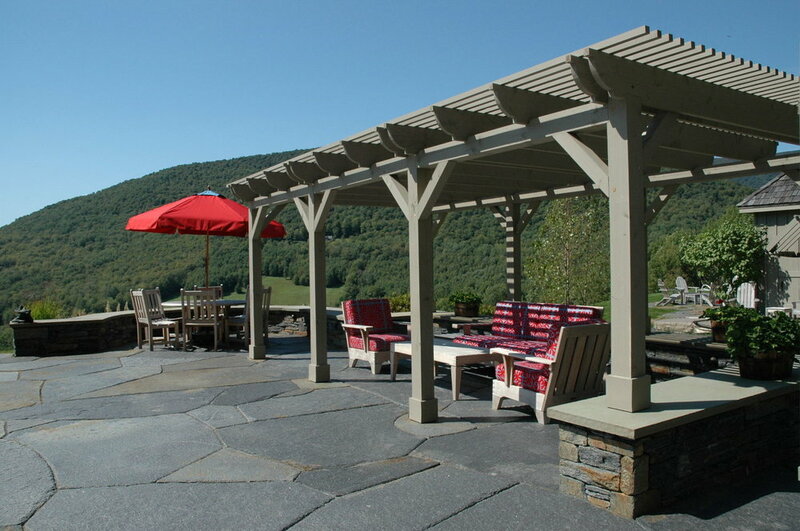 This pergola was designed using the geographic location in order to provide the proper amount of shade most of the year. Thanks Ramsay Gourd Architects for your keen understanding of how this all went together! To the right of the pergola we placed a pool house. As you will see in the next picture, it is a great place to get changed or take a nap! Great for napping by the pool (there is even a trundle bed under the day bed). And cold drinks are stored in the fridge in the right side cabinet. This image is courtesy of Ramsay Gourd Architects. This pond house cantilevers over the pond for a great jumping off point. It doubles as a ice skating pavilion in the winter time. You can sit on the edge, put on your skates and off you go! This adorable doll house is available through Jamaica Cottage Shops. We love the double doors on the end. They make storing larger items so much easier. 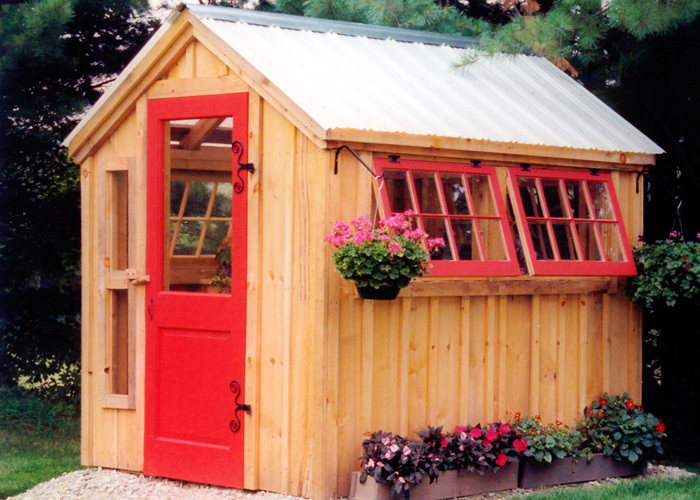 Another beauty from Jamaica Cottage Shops is this greenhouse. Super cute! Dream big for your Happy Home!!! Take inspiration from the Pagoda Tea House at the Marble House in Newport, RI. Outdoor follies can provide their own space for inspiration. Here is one of my favorites located on Garden Island in Lake Champlain off the coast of Charlotte, VT. It is built into the cliffs of the island and impossible to get a photo of unless you are out on the lake in a boat. This will have to do for my inpiration! I'll take it! Day 146 of 365 Days of a Happy Home! 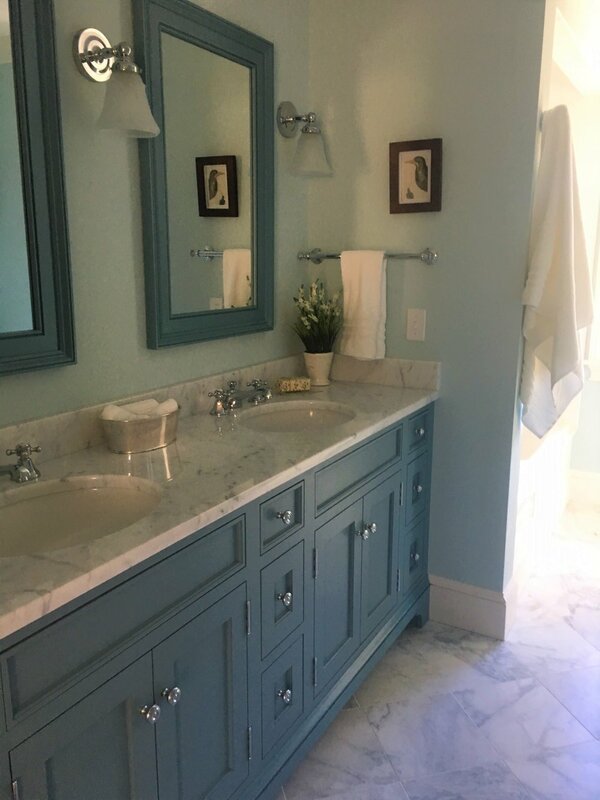 Benjamin Moore's Province Blue on the vanity is a nice compliment to Ben Moore's Summer Shower on the walls. These colors, along with the marble floor and vanity top help to create this relaxing bathroom. White on white on white! Ahhhhh! The Simply White trim with the Dove white walls and the marble help relax us. Add the polished nickle faucet and sconce plus the children's silhouettes and we just have to smile. More white on white with pops of blue. Sweet dreams! Change rooms, change focus without losing that relaxing feeling. Tan walls with a flat finish surrounded by chocolate brown trim with a satin finish. Don't you just want to cozy up with a good book? The walls are Ben Moore's Woodlawn Blue and the trim is Kendall Charcoal. It easily brings you into the office where the trim is Kendall Charcoal with Muslin walls. The two tone walls in this dining room help to create an intimate setting for a dinner party. I like to use a darker color below a chair rail. It helps to ground the space. Where will you use calming color? Share your ideas and comments with us! We love to hear from you. Day 145 of 365 Days of a Happy Home! A back splash can be decorative, functional or both! It keeps soapy water or bubbling sauces from staining the wall. Most often a back splash is found in a kitchen, but we also use them in bathrooms. Take a look at some of the different ways we have crafted these beauties. Here is a broader view of the picture above. This small kitchen is in a post and beam guest house. There are a lot of natural elements in the space and we wanted that to hold true for the kitchen. 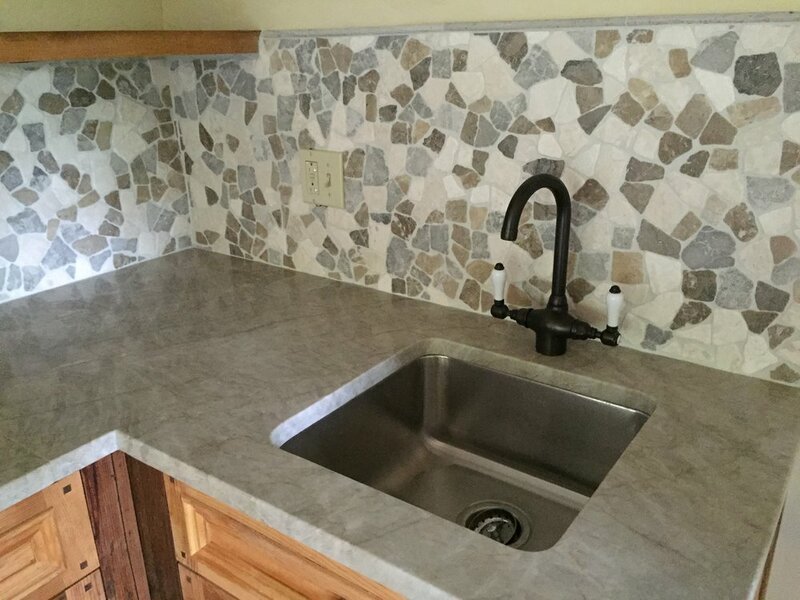 The natural stone top and back splash are a perfect complement to the rest of the guest house. We used a stacked pebble back splash in this bathroom that not only has varied color but also lots of texture. Truthfully, I wish there was less grout and more pebble showing. It would have had the look of a climbing wall. Initially, our client wasn't sure she should take this glass subway tile to the ceiling. But we're so glad she did. I love how it highlights the detail in the hood and the crown molding. 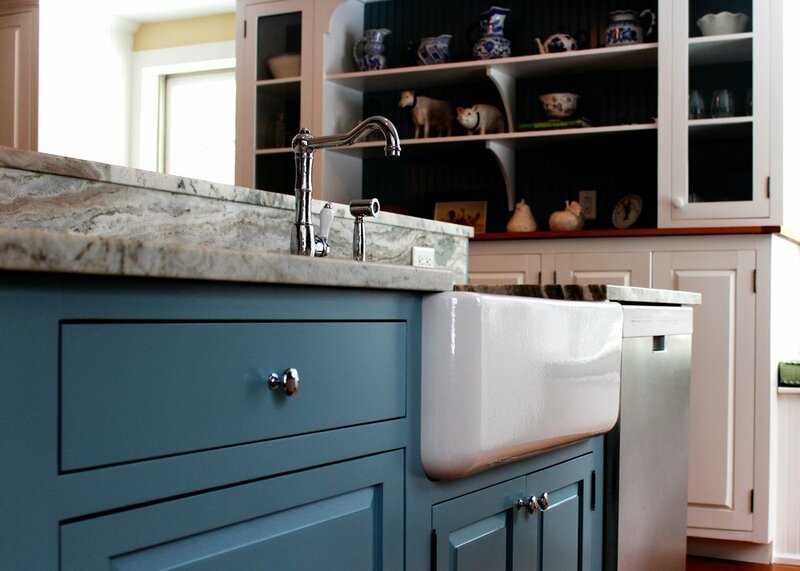 This farmhouse sink is in an island with a breakfast bar. Both the island and the breakfast bar have the same stone top. We book matched the slab for the back splash. Not only is it functional, it's beautiful! This kids bathroom gets lots of use. We re-purposed an old work bench with an antique double sink and 2 faucets. The galvanized, corrugated wall back splash/wall is functional and fun! We used a 4" piece of the slate counter top for the back splash in this kitchen. We think it's perfect! Great team work with the builder on this installation! 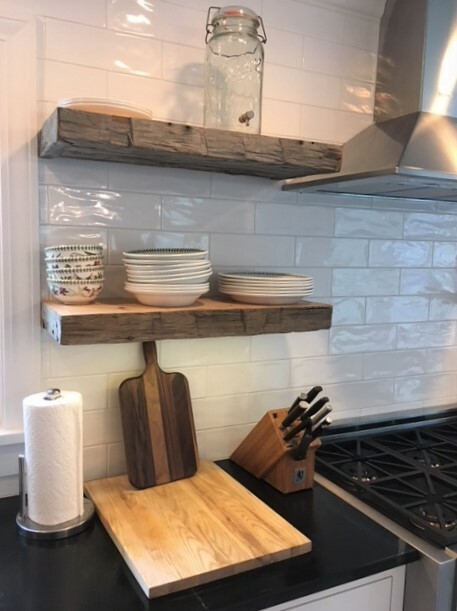 He installed metal posts into the studs to hang the shelves, installed the hand molded subway tiles, then slide the custom shelves on to the posts for a clean look. What do you think? Do you have a project that needs a back splash? We'd love to hear about it! Send us pictures to share! Day 144 of 365 Days of a Happy Home! The loft bed shown here and in the photo at the top of the blog is from CollegeBedLofts.com. It came disassembled and unstained. We could stain or paint whatever we wanted. There are added features that we didn't choose like a desk or bookshelves. We placed a PBTeen sectional underneath for hanging out or sleepovers. This set up works well from middle school through high school. It can be made feminine by the paint color, bedding and art. We decorated this room for a 2nd grade girl. 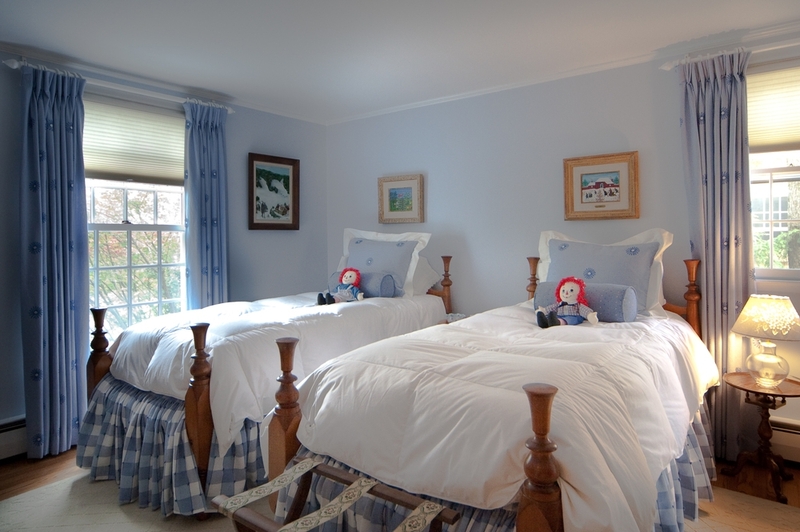 The dandelions on the wall are custom, and can be re-positioned or removed very easily. They mimic the dandelions in the shade fabric (Duralee Fabric). With a few tweaks (stuffed animals) this room can easily take this young lady through her middle school years. These headboards (made from skis my client no longer used) can go in a boy's or girl's room. They are fun for any kid who skis, no matter what the age! These built in daybeds are ready for any preteen and can take them all the way through high school. The built in shelves have a charging station (you've got to keep your devices charged!) plus a dimmable night light (for those afraid of the dark...come on, you know who you are!) The grey and orange paint can be made more masculine or feminine with pillows and bedding. This is definitely a young girl's room. But, remove the Raggedy Ann dolls and it can work for a middle school or high school girl. Here we are back at the 2nd grade girl's bedroom. Her desk is a bit small for an older child, but the lamp, desk chair and book rack can transition nicely as she gets older. She'd definitely need new art work, though! How have you created your kid's room to grow with them? We'd love to see your pictures! Day 143: The Well Equipped Bathroom! Day 143 Of 365 Days of a Happy Home! 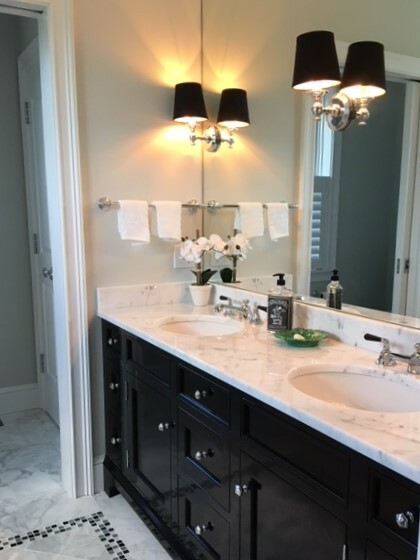 This is one of our favorites...wall to wall mirror glass, double sinks, marble top, lever handle faucets and high gloss vanity! This small bathroom had room for a shower but no tub. The entrance to the shower is all glass. This along with the darker tile on the lower half of the walls makes the space feel bigger. We added a handheld shower for easier cleaning. What about a bench in the shower? We matched the bench top to the vanity tops...local marble! We also tiled the ceiling of the shower using the small glass tile in the decorative band. Its a colorful surprise once you're in the shower! Don't forget to hang a robe hook by the tub or shower. You won't regret it! Neither will your guests! Low on wall space for towel bars? How about adding robe hooks to the back of the door? We had fun in this boys bathroom and used pipe fittings to create this sturdy towel holder. In this renovated barn we added a window seat with cushion made out of indoor/outdoor fabric (from Donghia). We also added a "train rack" for extra towel storage. Notice that we added a back splash behind this stand alone tub. It is attractive and will save the walls from water damage! In this renovation we were able to reuse a cast iron claw foot tub. It fit nicely in the dormer's eave. What can you do to make your bathroom "Well Equipped"? Share photos, we love to see what you've done! Day 142 of 365 Days of a Happy Home! Are your windows naked? Or perhaps they are drafty? 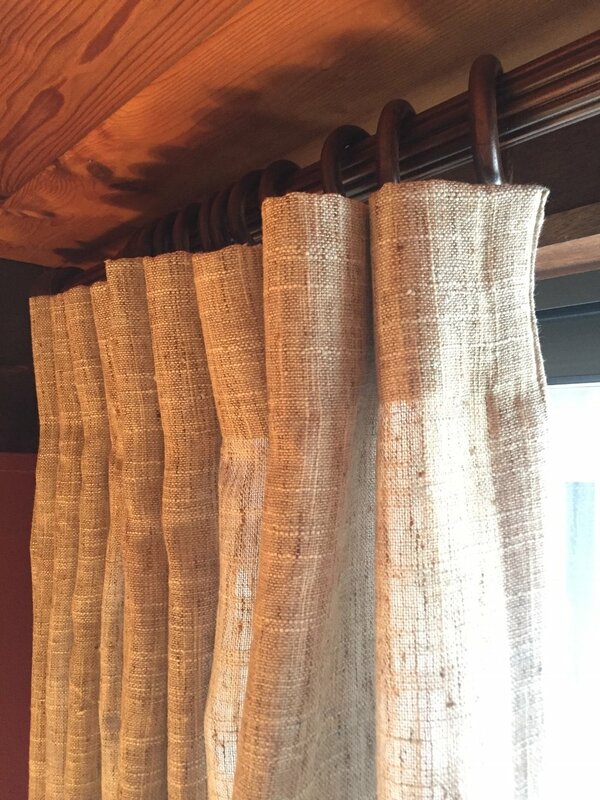 One of our favorite types of window dressings are drapery panels. I use pleated panels a lot, but have been know to use other styles as well. I like to hang the panels from rings using hooks in the back of the panel (no clips...they break!). I will often hang the rings on a smooth wooden rod painted the color of the trim in the room. What follows are some drapery panels we've made and installed for our clients. What do you think? These cotton linen panels are made from a Kravet fabric with pinch pleats. They are in a dining room and help to muffle sound. The drapery rod and rings were painted the color of the trim (Benjamin Moore Kendall Charcoal) which is a close match to the grey in the fabric. This fabric is rather sheer. The client wanted to have privacy but still have filtered light in the room. This fabric from Pindler & Pindler was perfect for these sliders. At 118" wide, our workroom pleated up a full width for each panel and we used 2 panels to cover the door. Again we used a Pindler & Pindler double width fabric (which means no vertical seam in the middle of these panels). The sheer fabric allows for privacy and filtered light in this living room. This client never intended to pull the drapes shut. Our intention is to soften the space with panels at either end of the matched cornices. We doubled the panels in the corner to make it look like you could shut them if you wanted to. The decorative trim on the leading edge of the panels is a nice touch. The medallion pattern on these drapes plays off the blue in the sette and the dark grain of the floor. This was a tricky space. We had a kitchen that opens to the dining area and the front entry hall. All of the spaces have sliders out to a deck. We wanted to introduce pattern, but not the same pattern in all 3 spaces or lots of different patterns. The panels at the slider in the center of the picture have stripes of fabric in colors that are a nod to the spaces on either side. We also kept the panels off to the side for easy access to the deck. At night they just pull shut for privacy. Panels are useful on interior french doors for privacy. 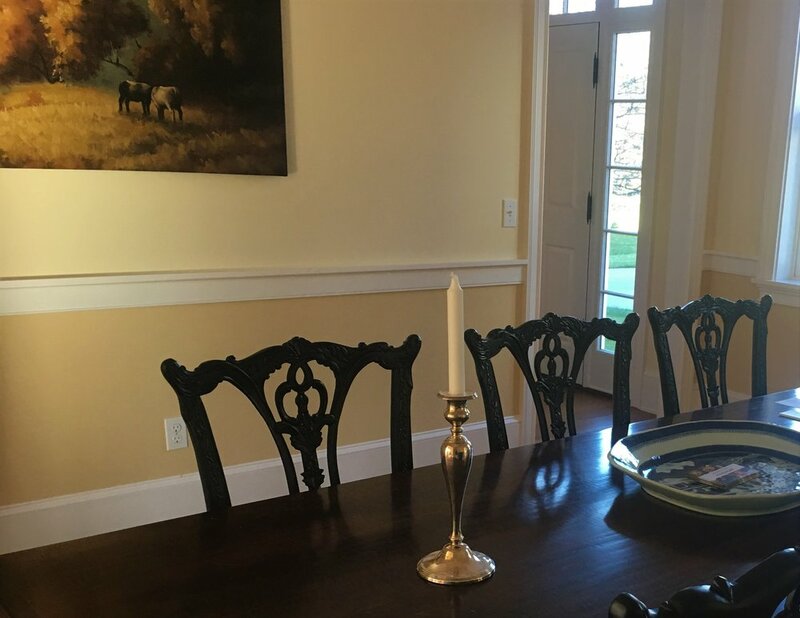 In this dining room we treated these doors like we did the windows with linen pinch pleat drapes hung from iron rods and rings that match the door hardware. Day 141 of 365 Days of a Happy Home! If there is a fireplace in a room, it shouts out to be the focal point. We like to make sure the style is in keeping with the surroundings, including architecture and furnishings, so it doesn't look out of place. Below are a few fireplaces we have had the opportunity to design...which one(s) suit your Happy Home? This fireplace is surrounded by Vermont green slate, indigenous to the area the house was built. Believe it or not, this is in a brand new home, but the mantle detail suggests it has been in existence for at least 100 years. Neutral walls and trim never go out of style. The fireplace is the antithesis of the one above. This is over 100 years old and in an antique farmhouse. The owner wanted to keep the simplicity of the original simple mantle and paneled wall. This allowed us to bring pattern into the room with drapery panels and the spool chair fabric. We added simple brass sconces to frame the artwork and bring light into the space at night. Another antique fireplace! If those bricks could speak! We did make some repairs and replaced the hearth and surround with Danby Marble, indigenous to this area of Vermont. Walls are painted Benjamin Moore Kendall Charcoal and add to the coziness of the room. We were fortunate to work with a local craftsman, Dan Mosheim to design the black walnut paneling in this room. It creates a warm surround for the room and a nice backdrop for the brick fireplace. We continued the brick to the fireplace surround and hearth (sorry you can't see it) so we didn't detract from the beauty of the wood. Here is a more modern take on a fireplace with lots of natural elements. Although the trim is painted, we have kept the mantle natural. The black walnut really is beautiful. Although the ceiling is birch, we were able to stain it to be very close to the color of the black walnut. The slate tile surround adds to the modern feel. This was an interesting project. The original house was built in the 1820's with a center chimney with 3 fireplaces to heat the house. The house was dismantled in the 1980's and moved to its current location. The chimney could not be moved, but was recreated in the same manner. This is the main fireplace where cooking would have happened. There is an iron bracket that holds a large iron kettle for cooking food. There was a bread oven on the left side that the owners added a small wood stove to. The brick hearth and surround work nicely with the original beams and painted wood paneling. What do you do when you want a fireplace but don't have a wall to put it on? Choose a gas insert either "vent-less" or a "direct vent". This client had only a TV on this large wall, but wanted a fireplace and a more cozy feel. We designed the built in bookcases to perfectly frame the TV and house a direct vent gas fireplace unit. The builder found the old beams to make the mantle. We are happy with how this turned out and so is the client! Day 140 of 365 Days of a Happy Home! Artful layering in a room involves mixing it up...texture, color, scale, materials...to make the room the best it can be. In the above picture, we renovated an old barn into a guest house. This is a bunk room to which we add v groove paneling to the walls and ceiling. Then we white washed them. 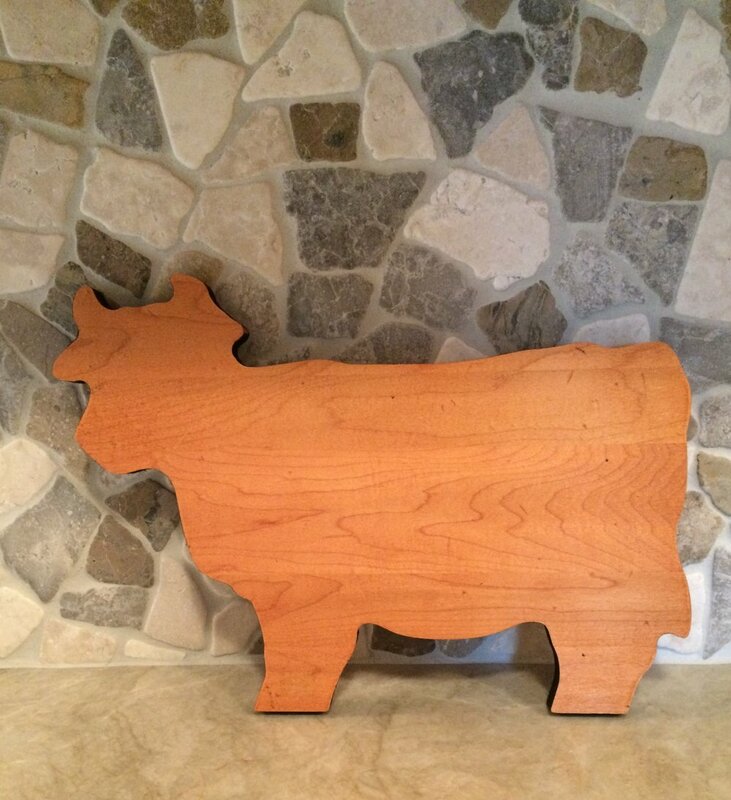 We kept strategic elements of the original 150 year old barn to make it feel authentic. We added an iron bed, iron light fixtures, wood floor, re-purposed door (from the property) along with textural elements on the bed to get an overall feeling of a Happy Home (barn!). Below are more examples of artful layering from our archives! We had the pleasure of working on this home from the ground up. In the mudroom we played with texture and color. The floor is re-purposed brick layered with a woven cotton rug. The built in bench is painted a contrasting color to the walls. We echoed the color in the rug and the cording on the cushion. All the while the wood trim and door are white. This makes a nice frame around the room. In this room we artfully layered the windows with a stripe roman shade mounted inside the window and pleated plaid drapes mounted above the window frame. The fabrics, though different patterns and scale, compliment each other. We anchored the room with a chair rail, painted the trim color (yes, we like white!) below it is painted Benjamin Moore Down Pour Blue. This bathroom was so fun to put together. The walls are corrugated roofing metal (galvanized). We found the antique sink at a salvage yard and we placed it atop an antique workers bench we found on the property. Plumbing fittings come out of the wall and towel bar is made from pipe fittings. We played with scale, texture and colors in this bedroom. The grey and green colors contrast nicely, as do the cane bed and the rush baskets. You can easily artfully layer a small space such as a dresser top. Here we flanked the antique mirror with matching vases of silk flowers. Then added a small tray for trinkets. Using different shades of neutral colors adds to the continuity. The small sprigs of lavender in the flowers adds a pop of color. We hope we have sparked your creativity! What will you artfully layer? We'd love pictures!!! Send to our email in the contacts section of the website!